In March 2004, the Society acquired Plum Island, a 45-acre island across from Starved Rock State Park in the Illinois River. The island had been threatened by a series of plans for residential and commercial development. A three-year struggle to save it ended successfully due to a generous grant from the Illinois Clean Energy Community Foundation. Bald eagles use the island as a wintering site, perching in the trees and flying forth over the river to feed at the nearby lock and dam. 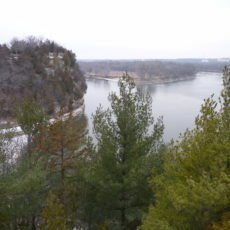 The Society wanted to save the island not only for eagles, but to preserve the scenic view from atop Starved Rock, and to protect the Native American archaeological sites which are there. Reforestation of part of the island is ongoing, and it will be closed to visitation except for stewardship activities. Many hours of volunteer time have been donated to help plant trees.